Streetcars and buses both operate on city streets, in similar ways. So why go to the trouble and expense of building streetcars? Because there are, in fact, inherent differences that make one or the other better, depending on circumstances. First, what’s not an inherent difference: The running way. Both streetcars and buses can, should, and do operate in both dedicated lanes and in mixed traffic with cars. When and where they do so can make a huge difference to a line’s effectiveness, but that decision is not dependent on the vehicle. The point of this list is to compare the modes when all other things are equal. Streetcars have greater capacity than buses. Streetcars are bigger, longer, and can be combined into multi-car trains. They can carry many more passengers than any bus, even accordion buses. For corridors with ridership too high for buses to handle comfortably but not high enough to justify a subway, streetcars can be a good solution. Streetcars can be more affordable than buses over the long term. While it’s true that streetcars cost more to build up front, that cost can be offset by operational savings year-to year, if the line carries enough passengers. Streetcars’ higher capacity means if there are lots of riders on a route, you can move them with fewer vehicles. Fewer vehicles means more efficient use of fuel and fewer (unionized and pensioned) drivers to pay. Streetcar vehicles themselves are also sturdier than buses, and last decades longer. In the long term, streetcars can be more affordable on very high ridership routes. Streetcar tracks reassure riders they’re on the right route. In any big city, buses are confusing. There are so many crisscrossing routes that buses are intimidating and difficult to understand. 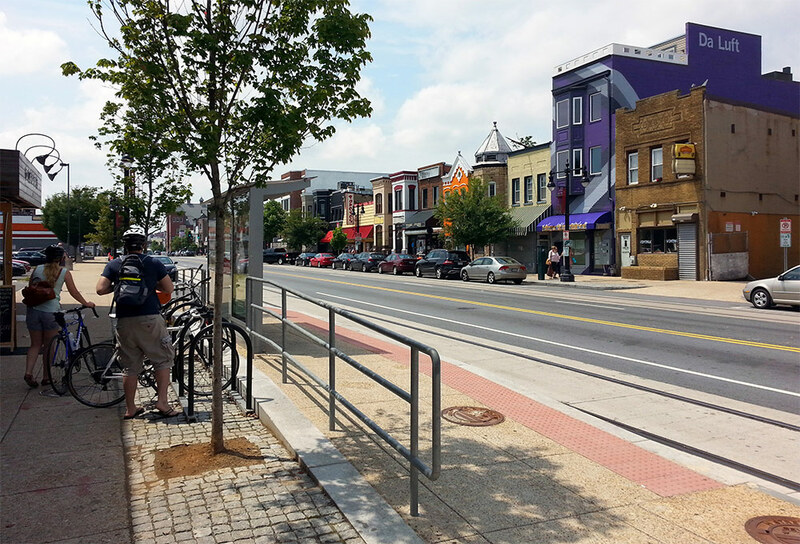 For example, DC’S 16th Street has no fewer than 5 different routes, with two of them labelled identically as the S2 despite different destinations. New users are turned off because they don’t want to accidentally get on the wrong bus and end up far from their real destination. Since streetcars have to stay on their tracks, streetcars reassure riders their vehicle will go where they want it to go. Streetcars stand out. The fact that streetcars are expensive to build means cities can’t realistically put them on every route. The size of any streetcar system is therefore inherently limited to only the more important routes (though how a city defines “important” may vary). This provides a convenient proxy for people to know where the best transit routes are, since most people don’t memorize their entire region’s incomprehensible jumble of bus routes. Instead of that jumble, streetcars provide a simple system map that’s easy to memorize. Meanwhile, trains are also civic icons. Tourists visit them, photograph them, and send postcards featuring them, all of which enhances a city’s brand. It’s true that frequent route networks and unique branding can bring some of these same benefits to buses, but streetcars are more powerful and noticeable symbols. Streetcars are more comfortable to ride than buses. Any vehicle running on large tires over asphalt will sometimes be a bumpy ride, especially if the pavement is in less than perfect condition. Gliding along a rail is inherently smoother, making for a vastly more comfortable ride. This issue isn’t often discussed in newspaper articles, and rail opponents like to pretend it’s not a big deal, but it matters. And it’s not strictly a luxury issue, there’s a practical benefit: A smoother ride means passengers are more willing to stand, allowing for more open railcar interiors that maximize capacity. Streetcars are quieter and cleaner than buses. Because they run on electricity, streetcars are very quiet and emit no vehicle exhaust. While it’s true that electric trolleybuses exist, they are almost never used in the US because of BRT creep, and no new US city has introduced them in generations. This isn’t a truly inherent difference, and it may disappear as wireless electric buses proliferate. But for the time being it’s a legitimate difference. Streetcars are sometimes faster than buses. Most streetcars have at least 3 doors, and many models have 4 or more. That means passengers at stations can load and unload faster, meaning streetcars can spend more time actually moving, and less time dwelling at stations waiting for passengers. Thus, when streetcars are not held up by other traffic, they’re faster than buses. 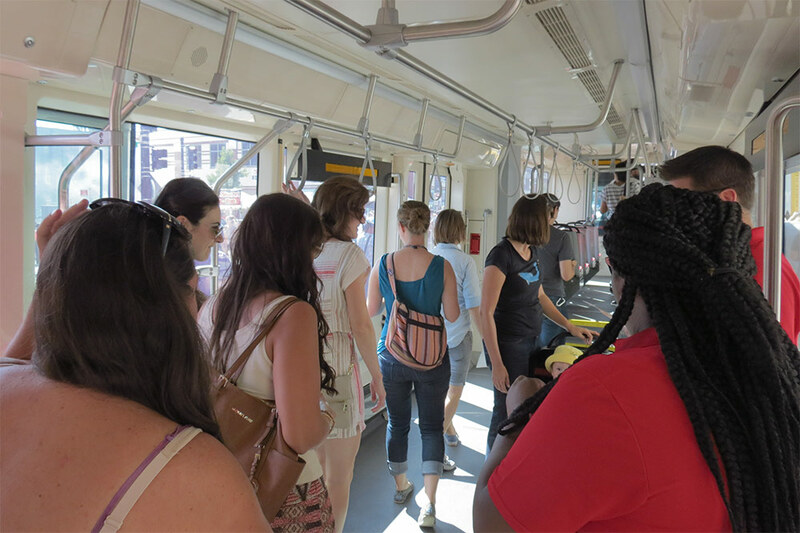 Streetcars attract more riders than buses. For all these reasons, people who would never consider riding a bus will ride a streetcar. Operational details trump all else, but when every other detail is equal, rail attracts more riders. Of course, buses are useful tools too, and are the right choice in many (in fact most) situations. Buses must be a major part of every city’s transit network, including both local and rapid bus routes. But buses are demonstrably different than streetcars. They have different characteristics, accomplish different goals, and are more appropriate in different places. Buses are usually cheaper. Buses don’t require the huge initial construction cost of streetcars, and except on the highest-ridership routes buses are generally cheaper to operate. This fact alone means buses are the right choice for most routes. Buses can put more service in more places. Since buses are generally cheaper, a city can provide good transit service on several routes, going to several destinations, for the same cost as comparably-frequent service on one streetcar line. This is why every city in America uses buses instead of streetcars for most of its routes, and only introduces streetcars at special locations. Buses are more flexible. Streetcars must run on rails, which sets their routes in stone. That’s both a blessing a curse. While it means riders will always know where a route goes, it also means branching routes are impractical, which limits how broad an area transit can cover. Buses give transit operators the ability to send some buses that start off on the same route to different locations, such as how DC’s S2 and S4 Metrobuses split near Silver Spring. Buses can skip ahead. On any street with more than one traffic lane, buses can pull around obstacles and speed forward. Streetcars must wait for obstacles to clear, meaning buses in mixed traffic with cars are often faster than streetcars in similar mixed traffic. It also means express and limited-stop bus routes can operate on the same streets as routes that make all stops. Technically speaking this isn’t an inherent difference, since a streetcar line could be built with multiple parallel tracks and frequent crossovers, but practically speaking that never happens. The Louisville Railway Company was once located on the corner of 18th and Broadway. Yes, THAT corner . Irony City. You know, up until very recently I was of the mind that PUBLIC transportation (and I’m a user/proponent) in the current era in a city the size and shape of Louisville should be bus-based or bus-exclusive. My thinking went: it may not be all that inviting but it’s cheaper, allowing for greater bang/network for the buck and anything like light rail or streetcar should be off the table as it smacks of expensive urbane elitism in a forever politically-unfriendly environment with little appetite for anything but infrastructure starvation via low taxes. I rode buses while in Louisville. The bike racks were great! TARC was and is fine. I’ve since ridden buses and urban rail or various flavors in several other countries. But the thing that has swayed me toward supporting streetcar/light rail in a city the size and shape of Louisville has less to do with oft-repeated (though articulated well enough in the above) “head” rationale and more to do with the heart. I read an article recently that quoted a historian’s lament of of Penn Station’s demolition: “One entered the city like a god. One scuttles in now like a rat.” Apply that line of thinking (scaled down appropriately, of course) to Louisville’s transportation. Build something of lasting civic use and pride. Build something that appeals (and serves) rich and poor alike…that brings someone who could otherwise afford a Lexus down to regular everyday level without offense to sensibilities while simultanously dignifying those who have little other transport choice much more than a bus. I wish city movers and shakers could think more in the Big Four Bridge-significance mold (look: it was so good, it is still in use today – and by all sorts) and less in the shortterm, intentionally-or-not economic/class stratifying, Uber mindset of patches and half-measures (in which I lump gaudy E-buses). Which are nice, sure, but they really just double down on the status quo. The motives here are pure and sincere: increase transit rideshare. But conflating pure economic rationality (efficiently doing more with scarce tax dollars using buses) with feelings, attitudes, perceptions (improving image problems, shame factor, branding) is misguided. 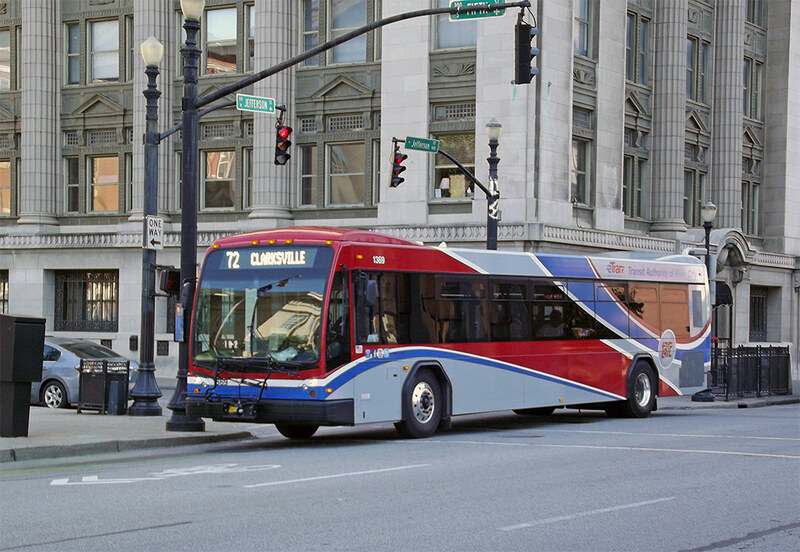 Transit–especially when it is not a runaway no-brainer choice over cars as in Louisville–faces an uphill battle. When the balance is so easily tipped between a convenient car culture or a town that could really improve transit, is the best way doubling down on the status quo and working on branding? Should attempts be made to trick people into liking something they’re already apathetic toward? Rail is more expensive, sure, but also bolder. Marketing and ads for buses amount to lipstick on a pig. (That’s an exaggeration…I like buses just fine. And pigs.) But current car commuters do tend to view buses as pigs. And spending money on something completely new and permanent might just be better than ads. Discussions of transportation policy and the advantages of low emissions, fuel efficient light rail or street cars need to discuss the powerful industrial interests implementing political policy that funds and builds the American single occupant vehicle transportation system. If 134 billion gallons per year of retail gasoline are sold and consumed in America, that demonstrates a fossil fuel marketplace that acts to insure its continued survival. The same with vehicle manufacturing interests. These multi-billion dollar markets are not going to set aside their profit systems because urban planners and enviros prove their inefficiency or destructiveness to the the ecosystem. The only way forward is to sell progress to the established markets. The same capitalists that swim in oil profits and car debt profits will have to replace that market with low or no carbon emissions transportation systems. If anyone can show a dollar for dollar transition from the current world destroying system to one informed by environmental science the markets will adopt it. The prospect of removing 600,000 cars from the Metro Louisville system and replacing the commuting system with no or low emissions transit is of zero interest to the Kentucky Petroleum Marketers Association. transition to no emissions without the gasoline partners taking a huge hit. New transportation policy is foundering on lack of transitional scenarios that realistically address market players. In 2013, automakers reached the best numbers in six years in the United States, with a total of 15.6 million vehicle sold. The Ford F-Series was the best-selling vehicle overall, while the Toyota Camry was the top-selling car. In 2013, about 134.51 billion gallons1 (or 3.20 billion barrels) of gasoline were consumed2 in the United States, a daily average of about 368.51 million gallons (or 8.77 million barrels). This was about 6% less than the record high of about 142.35 billion gallons (or 3.39 billion barrels) consumed in 2007. While I certainly support rail, I am always left to wonder if it would be introduced properly in Louisville. Given Louisville’s situation, I think the money could be better spent on improving bus service. The introduction of new buses (some of which are electric), an upcoming smart card fare payment system, real-time arrival information, and increasing ridership, all give me hope in the future of the system. So, I think we should build on that. Start with BRT-style improvements, especially along the busiest routes. I’d imagine this would help draw more people to the system and potentially increase its public profile. Dedicated lanes may not be a necessity along the entirety of the route; however, if used at key choke points it could really improve speed and service. If the success of those routes pans out I’m not sure what would stop you from upgrading those routes to rail later. I’m excited by all of the possibilities, and I sincerely hope that the local-option sales tax passes the legislature because these types of projects could be the beneficiaries of it! Did Buckminster Fuller die in vain? Look at transportation from a whole systems point of view–not from corporate bottom line next five years angle. All of our modern urban design insights key off of locating Louisville in a global economy and ecosystem. Thats a principal part of what separates ‘modern’ urban design- from design as an mere outgrowth of economic opportunism. Thinking for longterm sustainability and livability is intelligent design. Another key principal is integrating social justice into designing for achieving equity. BRT using fossil fuel propulsion and rubber chemical tires is a poor second choice to low emissions fixed rail lines. Manufacturing the street cars here, using locally trained labor here –to build and maintain the lines could directly address the need to retrain felons and provide jobs for unemployed. Instead, we buy off the shelf buses built elsewhere building no resilience into our community. We are more likely to design steam buses that run on coal. Street cars are incredibly dangerous for cyclists. The embedded metal tracks are wheel catchers, allowing tires to slip into the groove and not only cause the cyclist to fall in traffic, but likely bending and ruining the entire wheel. I have had this happen to me twice in Philadelphia. Another friend crashed and slid underneath a car. Metal tracks in the roadway also get wet and icy and easily cause bike tires to slip and crash. I’ve seen a dozen cyclists fall all all once when the track was frozen.